It was my turn to post Fire Day Friday over at Our Krazy Kitchen today. 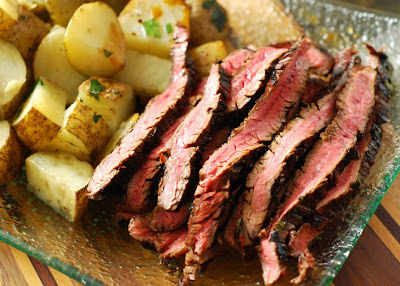 Click over there to find a quick marinated flank steak that was delicious. One of the downsides to reading food blogs is that AFTER food related holidays, you see ideas that you wish you had seen BEFORE the holiday so you could have tried it. 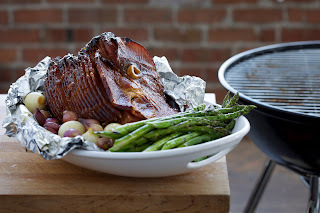 I've been looking at some ideas for next weekend's Easter ham and I think I have settled on trying a version of this one from Chris Lilly. I love cherry with ham so I'll swap out cherry preserves for the apricot. In a medium bowl, combine the glaze ingredients and mix well. Double a large piece of aluminum foil and place the ham, flat side down, in the center of the doubled foil. Pour ½ cup of the glaze mix on top of the ham and spread it evenly over the entire ham. Wrap the aluminum foil tight over the ham and seal it. Prepare an outdoor charcoal grill for indirect cooking by situating the coals on only one side of the grill, leaving the other side void. When the grill reaches 300 degrees Fahrenheit, place the wrapped ham on the void side of the grill and close the lid. Cook for three hours or until the internal temperature of the ham reaches 140 degrees Fahrenheit. Remove the ham from the cooker, unwrap the foil, and place the ham in the center of a baking pan. Pour the remaining glaze over the top of the ham and spread it evenly. Place the ham back on the grill, close the lid, and cook for an additional 10 minutes or until the glaze firms. Remove the ham from the grill and serve. Recipe created by champion pitmaster, Chris Lilly, on behalf of Kingsford® charcoal. Reprinted with permission from Kingsford charcoal. Do you do anything special for Easter weekend? Have any menu ideas already in place? Heavy rains are hitting Knoxville tonight so I'm cooking indoors tonight and planning out my weekend of grilling. Have a great weekend everyone!!! !